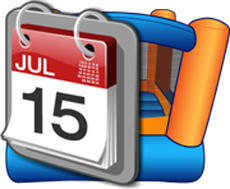 Choose BC Bounce Parties for your next event! 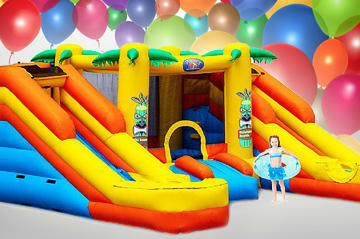 BC Bounce Parties, Your Source for Party Fun! Thanks for visiting BC Bounce Parties, your party fun source! Here you'll find great deals on all your favorite inflatables and party accessories, like our "18' 2-Lane Rainbow Water Slide ", and the "Magic Castle Bounce House" that's fit for a king, and the largest bounce house in the area! We also have easy to use concession machines that make good parties great with the addition of fresh popcorn, sno-kones, and cotton candy. It's never been so easy to reserve your entire party rental online. Our online reservation system allows you to browse our site, check availability, and make your reservation. You can be sure your rental will show up on-time, clean, and ready to bring the fun to your celebration. Making your event or party rental reservation at BC Bounce Parties is as easy as one, two, three! Just click the link below and enter the date and times of your event, then as you browse through our exciting party rental items, you'll be presented with those items that are available on your selected date. Not ready to order yet? No problem! Just browse the rental categories below and you can use the "Add to Cart" button located on every product page. Everybody likes to save money and get the best value, so BC Bounce Parties has created a variety of "Value Added" party packages designed to give the best value at the best price. You can choose from complete party packages with inflatable selections and concessions, or get complete table and chair packages. You're sure to find the best deal for your celebration here. Inflatable Bouncers (or Jump Houses, or Moon Walks, whatever you would like to call them) & Water Slides are America's favorite event attraction. 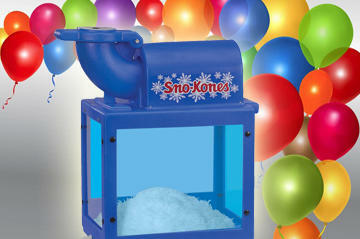 Get one for your party or event today, and add some bounce to your bash! BC Bounce Parties concession machines are easy to use and can make all the difference when your guests start lining up for these tasty treats! Rent yours today! If you're responsible for the party planning, you'll want to make sure everyone gets a seat at the table. 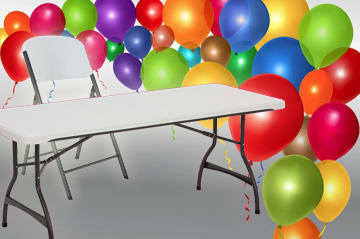 BC Bounce Parties makes that easy with table & chair rentals. Free Delivery to Select Areas! Free Delivery; Can it be true? Absolutely! 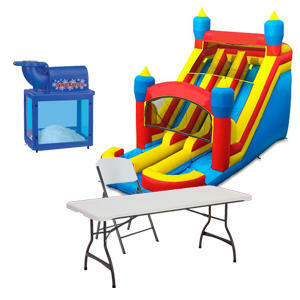 BC Bounce Parties provides free party rental delivery service to select zip codes located a short distance from our warehouse in Binghamton NY. We also provide delivery service out to areas as much as 45 miles from Binghamton with a reasonable delivery fee. If you are interested in getting delivery information for your specific location, click the button below to go to our delivery page and see where we offer free delivery, and the price of deliveries to other zip codes, or just call us at (607) 595-2047, and we will be happy to assist you. 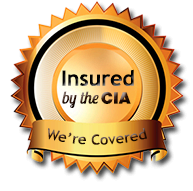 We are fully insured for your (and our) protection! In addition, our staff are SIOTO-trained in how to set up our inflatables in a safe manner for maximum enjoyment at your party!